One of my resolutions (along with combing my hair in a reasonable time frame every morning) is to write reviews of what I read and like, so that I can remember these things later. Especially short stories, which I can't rate by simply clicking on a star rating on Goodreads. I enjoyed this story tremendously. A repairman who's seen it all sees something new. The story's lighthearted, heartwarming, and it scratches that itch for stories about ordinary working Joes on space stations. Read if: You liked James White's Sector General books or that one episode in B5 with the repair guys. Don't read if: You're looking for SF that breaks new ground. 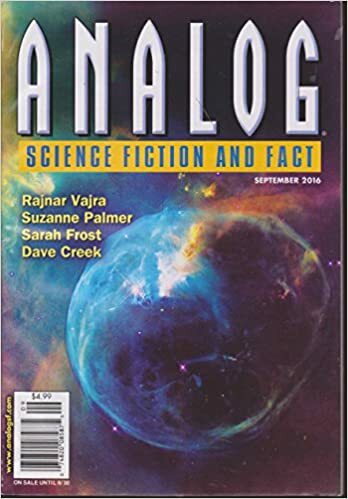 How'd I get it: A magazine giveaway in the SFWA suite at MidAmericon II. Where'd I read it: In the sauna at the gym. I swear, I wasn't lightheaded. This is also how I discovered that the sauna heat will melt some magazine glue bindings. * They don't have back issues available for purchase. Not even digital ones. Let people give you money!